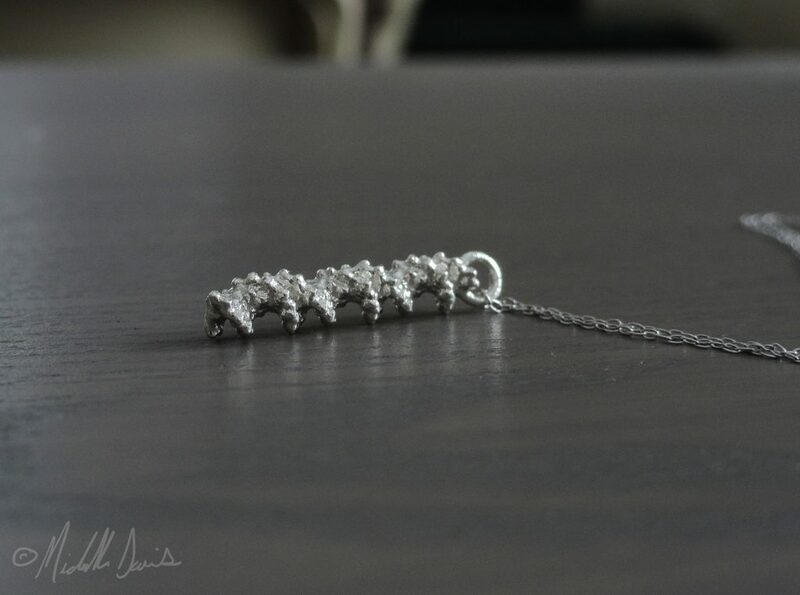 I am very pleased to share the development and outcome of the creation of a molecular DNA pendant! It is based on real molecular shape data – not only the familiar double helix but the true bubbly shape the molecules take within the double helix form is represented in this pendant as well. Currently I have this available on both Shapeways and Etsy. It would be naive to think there are no other pendants like this, but this is the only one I’m currently aware of that takes the detailed molecular form into consideration. I also quite like that it’s rather abstract. Passerby may not catch the DNA aspect, and that’s okay. 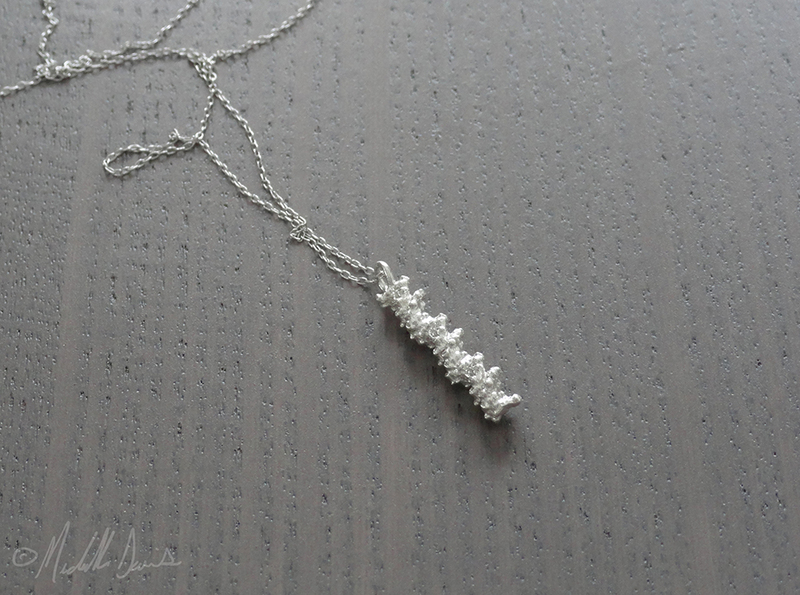 It is a scientific piece of jewelry that is subtle in its scientific nature on first glance at least, and as such doubles as simply a attractive piece of jewelry. But if passerby ask, you can tell them why this pendant is so interesting. The data and information for the molecular form itself was a listing in the PDB or Protein Data Bank. It is a fabulous and free resource where information about proteins and other very small structures are published online. (And they have a page clearly outlining that usage such as mine is completely okay and allowed). The form for this pendant was taken from the “1BNA” DNA structure, originally released way back in 1981! This is a synthetic snippet of DNA in the ‘B’ spiral form, published by authors Drew, H.R., Wing, R.M., Takano, T., Broka, C., Tanaka, S., Itakura, K., Dickerson, R.E. 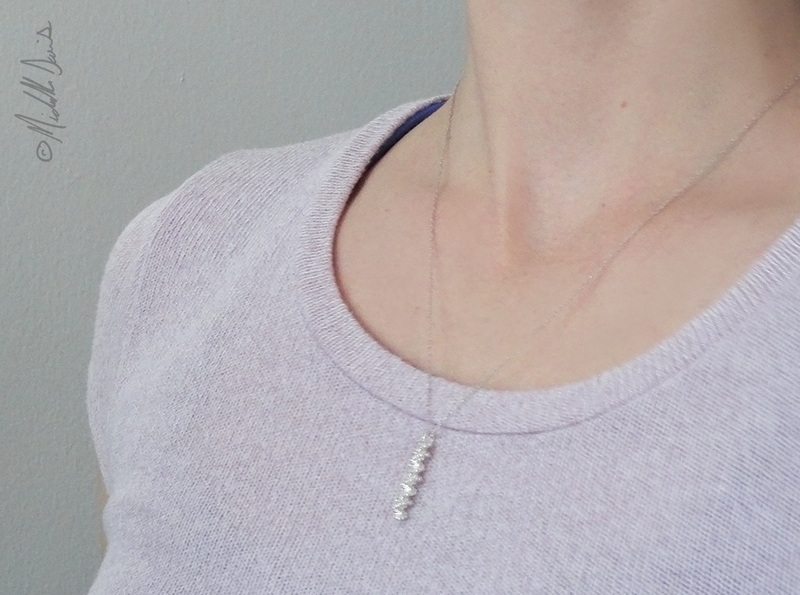 My husband is also to thank for this; he purchased another DNA pendant for me last Christmas, which was not to my liking but made me think about a DNA pendant I would like to wear. Thus this one was conceived! There are a few ways to transform PDB molecular information into a digital 3d shape you can use in 3D software. What I did was download the .pdb file, then use a little piece of software called Chimera to display and then export the surface data as a usable 3d model (in obj file format). 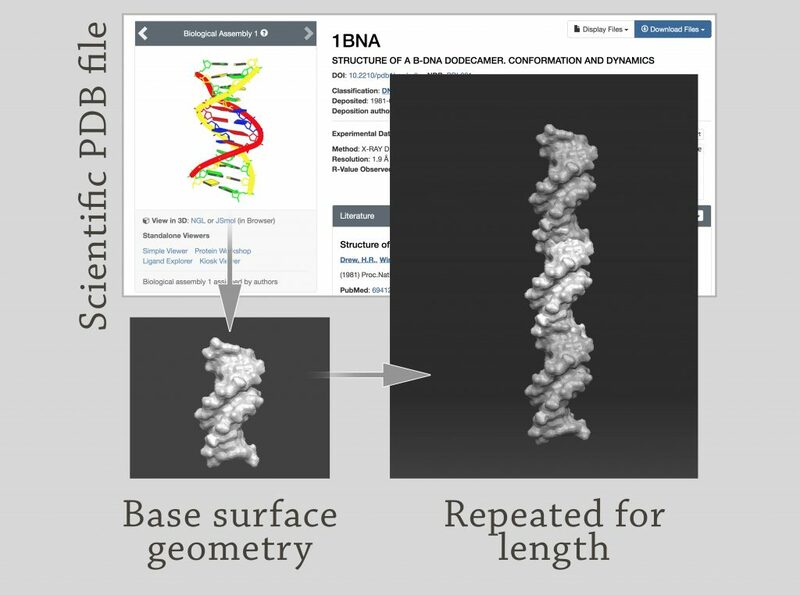 My biological modeling software of choice is Zbrush – in this software I tripled the length of the helical DNA structure and inflated subtly to insure a structurally sound pendant. Then finally in Blender (which has more definitive grid and sizing units than Zbrush) I added the ring on top for the chain, and finally uploaded this to Shapeways.com to be produced in solid sterling silver! Finally, here are more images!